And once you’ve got them open, you can edit and save them, or copy info etc. How many times have you wanted to just make a small change to a PDF file before you send it on to somebody? Or make comments on a PDF you’ve been asked to review. Bingo! 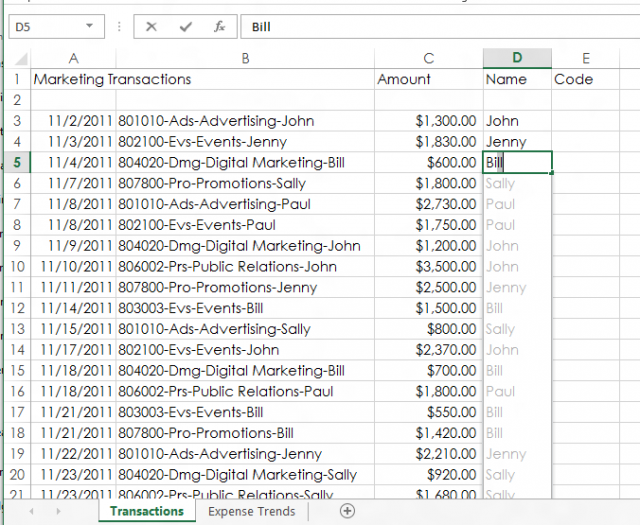 There’s a new feature in Excel 2013 called Flash Fill. And once you’ve used it, you will never want to go back to spreadsheet software that doesn’t have it. It’s going to save me hours of typing and formula. Here’s how it works. It takes a look at what you’re typing into a column, and then is able to predict what you’re trying to do. So in the example below, it actually works out you’re creating a column of people’s names, from the contents of Column B. And so it fills the column for you. Can you imagine how much time this is going to save teachers – how many times have you sat down with a spreadsheet with a list of full names and you’ve wanted to just have a column of initials? Or you’ve been given the name as surname-firstname, and you want it to be firstname-surname? Flash Fill can do it. This is simply a genius idea. And if you want to see some amazing examples, watch this YouTube video from an enthusiastic Excel user to see how it can be used to extract, combine, insert or reverse data. (And learn the magic of the CTRL-E key). See the rest of the "10 Things You’ll Never Have to Say With the new Office"